With so many options available for flooring these days, it’s easy to overlook carpet when choosing the right surface for your home. Many clients I talk to think of carpet as beige, bland, and boring. There are lots of boring ways to do carpet, but carpet has also come a long way since the shag of the 1970s. Carpet is also good for energy efficiency; it warms and insulates your rooms and can help cut your heating bill. 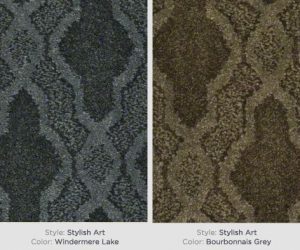 One of the biggest trends in carpet right now is a textured look. Texture adds depth and keeps your carpet from just being a dull afterthought. This Design Texture Gold Tweed in Corn Husk is neutral enough to match a wide variety of décor, but it goes way beyond basic beige. Patterned carpet is another way to keep your floor fresh. 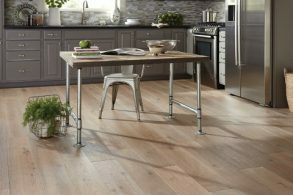 This pattern from the Shaw Flooring Caress Collection, called Stylish Art, has an elegant and timeless arabesque pattern. A pattern like this would be perfect for a formal living or dining room. If you’re looking for something more plush, something like Shaw Celeb carpeting may be for you. It has the soft, luxurious feel that is perfect for a bedroom, and it comes in a variety of colors. Don’t you want your feet to hit something warm and soft first thing in the morning? It’s a great time to choose carpet for your home – we’ve got free installation on select Shaw carpeting. Stop by our studio to see samples of our carpeting in person, and talk with our staff about the best carpet for your situation. We’ve got carpets that fit every budget, style, and function, so you’re sure to find something you love. You can also follow us on Houzz to keep up with our latest projects, and to find inspiration for yours. Product Feature: Life Guard Carpet because Life Happens!